On 14 September 2016, the European Space Agency (ESA) announced that during its first 14 months, Gaia had pinned down the precise position in the sky of 1142 million stars. The UK plays a significant role in data processing. Groups involve Cambridge, Edinburgh, University College London’s Mullard Space Science Laboratory, Leicester, Rutherford Appleton Lab (RAL) and Bristol are all key players in the processing of raw data. This Gaia data release marks the first chance astronomers and the public have had to get their hands on the most detailed map ever made of the sky. Gaia has already been producing early scientific results over the past two years in the form of Gaia Alerts identified and released by the Cambridge team. There is a wide range of Gaia’s discoveries arising from Science Alerts – supernovae of various types, cataclysmic variable stars, novae, flaring stars, gravitational microlensing events, active galactic nuclei and quasars, and many sources whose nature remains a mystery. These are made publically available and are followed up by astronomers and school groups. Gaia originally stood for Global Astrometric Interferometer for Astrophysics. As the project evolved, the double-interferometer concept was replaced with different instruments. However, the mission name remained even though it no longer uses an interferometer as part of its telescope design. The measurement accuracy expected for Gaia is about 10 to 100 times greater than what was achieved for the Hipparcos mission. The number of objects observed will be 10,000 times greater. 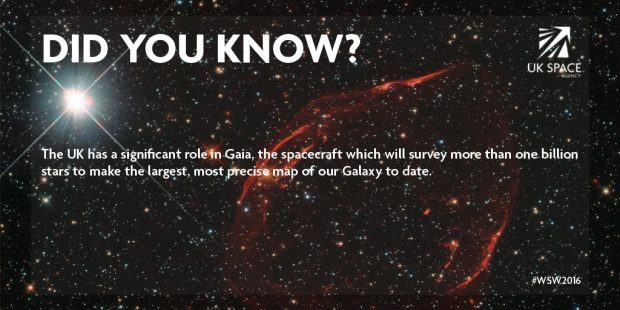 As part of its mission, Gaia is expected to detect tens of thousands of stars that failed to ignite. These are known as brown dwarves. The information gathered will help scientists understand the formation of stars. Gaia will be equipped with two telescopes, projecting images onto a single integrated camera instrument. They record the position, brightness and colour of the objects under observation. The spacecraft is equipped with a ‘micro propulsion’ system, allowing fine adjustments to be made to its position.